Navigation is an important aspect for vehicles, as it directs about the unknown ways to the driver. 3D maps for navigation have enlarged the usefulness and usability of maps. Drivers commonly prefer to have a map whilst travelling into unknown areas or within new cities. 2D maps have direction; however, the accuracy is not so high, unlike 3D maps that offer the driver with a more accurate map of the area. This assists in accurate navigation, position finding, and more comfortable driving. 3D maps created a revolution in the field of navigation. 2D maps are unable to describe the surrounding the way it is, and many times, it leads to erroneous navigation, as 2D map systems do not display information about the surroundings like bridges, work in progress on road, surrounding of road, terrain areas. However, 3D road maps have exhaustive information about the road surrounding as well as road structure. Accuracy, wider range of information, increasing tourism across the globe, amplified ride hailing, increased passion for wilderness and adventurous driving, and growing attraction toward tracking and hiking are primary factors driving the demand for 3D map systems. Moreover, increased per capita income has led to increased purchasing power, improved lifestyle, and enhanced level of automation in vehicles are likely to have significant impact on the rising demand for automotive 3D map systems. Autonomous and semi-autonomous vehicles are likely to hit the roads, which are expected to raise the overall demand for more accurate driving maps through 3D map systems. High definition maps, which have a high level of accuracy is expected to be a key navigational assistance to autonomous self-driving cars. Tourists prefer 3D maps as they are inclusive of comprehensive information about the road, vehicle surrounding, and terrain areas. According to a survey conducted at Zion National Park, Utah, in 2006, 53% travelers preferred 3D maps over 2D maps. In-dash navigation system is embedded within the vehicle’s dashboard. The in-dash navigation system segment is projected to hold a major share of the market during the forecast period. The segment is anticipated to expand at a CAGR of more than 22% between 2018 and 2026. In-dash navigation system is connected with the advanced driver assistance systems in order to facilitate appropriate guiding with acceleration and braking of the vehicle in accordance with the surroundings. Consequently, the demand for 3D map systems is likely to rise in tandem with the advanced driver assistance system. Autonomous cars, which are being tested on the roads, are expected to require live HD maps, which need to be updated continuously in order to obtain information about accidents, weather conditions, road closures, and live traffic. The software & services segment of the 3D map system market is likely to witness a decline in prices in the near future; however, after that, the price is expected to increase owing to the development of highly accurate HD maps. The per capita income in Europe and North American is high due to high level of industrialization and urbanization in these regions. Countries such as Germany and the U.S. are technologically advanced and have cars equipped with advanced technologies involving 3D map systems in order to support other integrated ADAS systems. In 2016, Europe dominated the 3D map system market with more than 40% share of the market. Europe is likely to witness an increase in demand for 3D map systems owing to the technological advancements, advent of self-driving cars, and increased spending by automotive OEMs on research and development. Countries such as China are known for availability of latest technologies at significantly lower prices. Key players operating in the global 3D map system market for automotive are expected to benefit from the formation of strategic alliances with component suppliers and vehicle manufacturers. 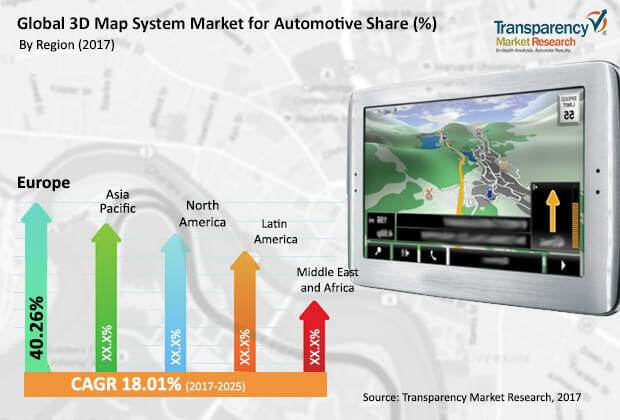 Prominent players operating in the global automotive 3D map system market include Robert Bosch GmbH, Continental AG, Denso Corporation, Aptiv, HERE, NVIDIA Corporation, and Elektrobit. HERE is a global leader in 3D mapping and map making. In North America, HERE is working to develop 3D map for the complete region. The development of HD maps is focused at autonomous vehicles. HD maps are key for the smooth functioning of autonomous vehicles. Robert Bosch GmbH, Continental AG, and Denso Corporation are focusing on the development of hardware and software in order to meet the demands from advanced semi-autonomous and driver-less vehicles.